This part four of eight posts about your chakras. We started with your root chakra, have moved now to your solar plexus chakra and are working our way up to your crown. 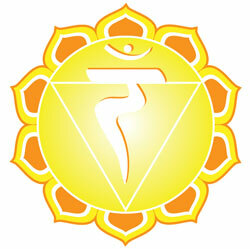 Your third chakra is your solar plexus, or manipura, is located at your navel. It is the core of our personality, our identity, and or our ego. The third chakra is our center of willpower. The gift of this chakra is sensing your personal power, being confident, responsible, and reliable. This is the center of your self-esteem, your willpower, self-discipline, as well as warmth in your personality. The energy from this chakra allows you to transform inertia into action and movement, to meet challenges and move forward with life. If you have excessive third chakra energy, you may be overly reactive to life circumstances. You may be tend to emotional outbursts and are often stressed out. Situated behind the navel, your third chakra is associated with the element of fire. It is the “fire in your belly”, your personal power and your core self. If your Solar Plexus Chakra is blocked when we feel insecure, frustrated; are afraid of being rejected. To balance this chakra, you need to revive yourself and boost self-confidence. Spend more time in the air, groom yourself well, take up some sports and notice the progress you make. I find strength in Warrior I Pose, or Virabhadrasana I. Standing in Mountain pose, or Tadasana. Take a deep breath and on an exhale step your left foot back about 3.5 feet. Turn your left foot to about 45 degree angle. Make sure your left foot is firmly planted and touching the ground. On an exhale, bend your right knee over the right ankle, so that your shin is perpendicular to the floor. If you can, bring your right thigh parallel with the floor. Raise your arms above your head and touch the palms together. Repeat on the other side for balance. Another excellent opener is Bow Pose, or dhanurasana. Lie flat on your stomach with your chin on the floor and your arms by your side. Bend your right leg and take a hold of your ankle with your right hand. Bend your left leg and take a hold of your ankle with your left hand. Gently stretch your legs towards your buttocks. As you inhale, raise your upper body and your thighs. Keep your gaze straight ahead and keep lifting your upper body and your thighs. Try to press your feet into your hands to open your chest more. Breathe.